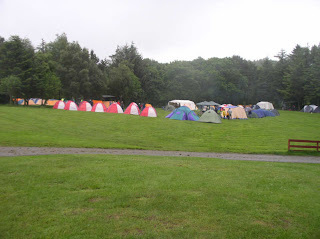 In preparation for the upcoming World Jamboree in July, several hundred members of the Scottish contingent descended on Fordell for a weekend of training and activities. Almost all of the available activity sessions were taken up on the Saturday, and a total of 18 Fordell staff helped out (a mixture of Fellowship, full-time and Project Scotland volunteers). Activity sessions were held on Saturday morning and afternoon, with both the Explorer Scouts and contingent leaders taking part. As well as the usual centre activities, the Jamboree staff laid on a number of additional ones including hovercraft racing, which was carried out at a location nearby - the site not having a suitable flat area once all the contigent had pitched their tents. After a hard day's work for both the Jamboree participants and the Fordell staff, the contingent leaders laid on a fantastic barbeque for everyone which was much appreciated (although there was so much food that the main problem was in trying to balance it all on a paper plate). 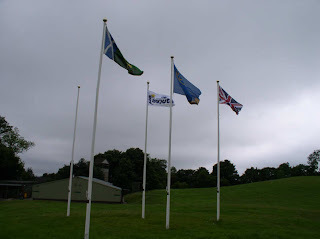 The weekend also saw the much-needed unveiling of 2 new flags for the site - a Union Jack and a Scouts Scotland flag (the latter being the only one of its type currently in existance!). The provision of these new flags was made possible by a very generous donation from the son of a local man who had been involved in Scouting and had sadly died recently, and wished to give something back to the movement.